The Centers for Disease Control and Prevention (CDC) have announced the launch of an investigation into a multistate outbreak of Salmonella I 4,,12:b:- infections that have been linked with the botanical substance kratom. Native to Thailand, Malaysia, Indonesia, and Papua New Guinea, kratom, or Mitragyna speciosa, is a plant that is typically crushed and made into a tea as a means to treat pain; it can also be chewed, smoked, or ingested in capsules. Known for its stimulant effects, the plant has been considered by governmental agencies as an opioid substitute, a concern that hits home as the United States continues to struggle with an ongoing opioid crisis. To this end, the US Food and Drug Administration (FDA) issued a public health advisory back in November of 2017 warning consumers not to use kratom. “FDA is concerned that kratom, which affects the same opioid brain receptors as morphine, appears to have properties that expose users to the risks of addiction, abuse, and dependence,” the alert reads. Since then, the FDA has been making efforts to better understand kratom’s safety profile. In a recent FDA statement, Commissioner Scott Gottlieb, MD, shared additional associated adverse events and scientific analysis of the plant with further evidence on kratom’s opioid properties. Now, kratom has been linked with another troubling effect: Salmonella infection. CDC officials are currently investigating an outbreak of Salmonella I 4,,12:b:- infections that have sprung up in 20 states. California is reporting the highest number of cases (28). Eleven of these individuals have been hospitalized as a result of the infection. CDC officials estimate that illnesses began on dates ranging from October 13, 2017, to as late as January 30, 2018; those who have fallen ill range in age from 6- to 67-years-old. No deaths have been reported thus far. The CDC has linked kratom as the likely source of the outbreak, as 8 out of 11 individuals who were interviewed reported consuming the plant via pills, powder, or tea. 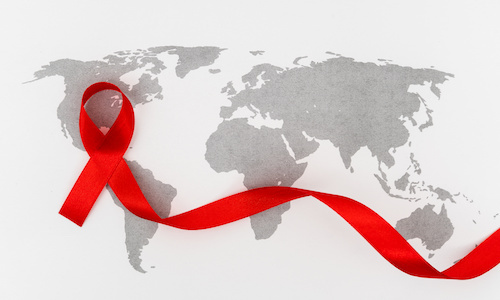 However, the CDC has not pinpointed a common brand or supplier. 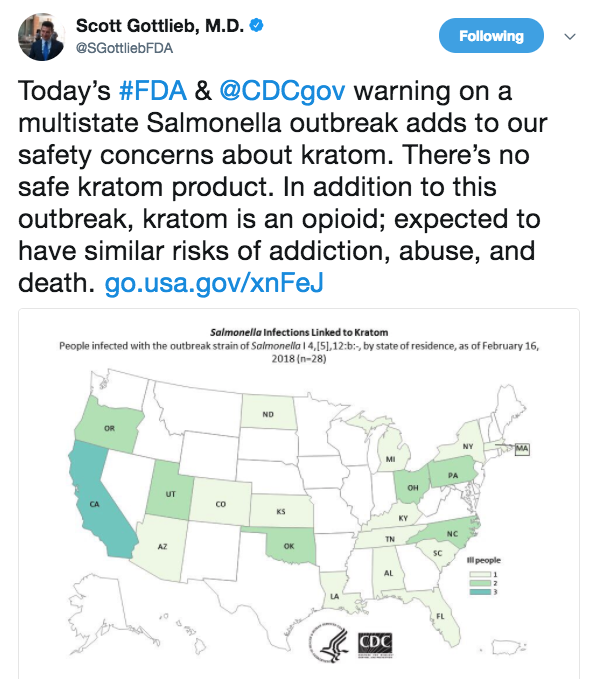 Dr. Gottlieb shared in a recent tweet how this outbreak just adds to the growing concerns regarding kratom. To learn more about the states affected by this outbreak and the current case counts, be sure to visit the Contagion ® Outbreak Monitor. Feature Picture Source: Michael Kray / flickr / Creative Commons.